A flexible venue with expansive grounds and a campus of historic homes, your wedding at Seven Springs can be truly one of a kind. Imagine sharing your vows under the canopy of historic magnolia trees as your guests sit comfortably in the shade. The wedding parties make grand entrances from their private suites just a few steps away. A flexible venue with expansive grounds and a campus of historic homes, your wedding at Seven Springs can be truly one of a kind. Read more below about the details of our various spaces throughout the campus. Main Floor - Built in a unique style unlike other Virginia homes of its time, the main floor, including the library, living room, dining room and foyer, are ideal for cocktail hour, a small reception, or for a quiet conversation. The flow of these rooms will complement the ease of conversation and movement of your guests. The Tavern - With a Colonial feel all its own, the tavern is a unique space that lends itself to many possibilities. The room encourages relaxation and fun with a card table, dart board, cozy seats by the fireplace, and kitchenette. It can be used as headquarters for your attendants as they await the start of the ceremony and with an exit onto the side garden and ceremony site, it could be just the grand entrance you are looking for! The downstairs of the Manor House can also be used as an extension of your event with the addition of a secondary bar and hors d'oeuvres. The Main Suite with en suite bathroom at the top of the Manor House. Guest Rooms - Located up the original walnut staircase from the main floor are three bedrooms. A master bedroom with a queen bed and en-suite bathroom and two guest rooms, each with double beds, a shared bath and unhindered views of the property. The upper floor of the Manor House sleeps a total of 6 guests. Main Floor -Overlooking the expansive backyard and courtyard, the main floor includes a full galley style kitchen with refrigerator, freezer, stove, double ovens, and dishwasher. There is a sitting room with a wood burning fireplace, half bath, as well as washer and dryer for guest use. The Lounge -Located on the lower level of the house, this room serves as a cozy space with a queen-sized sleeper sofa and large screen TV. This can serve as a guest room or just great place to relax before or after your event. Honeymoon Suite - With views of the entire property, couples can retire to their private accommodations to reflect on the day. Featuring a queen bed as well as two bathrooms, it is the perfect private getaway. The Suite - With soft hues and fine finishes this room boasts a gorgeous vanity, full length mirror, fireside seating, and great natural light, perfect for all of the finishing touches a wedding party requires. The Kitchen - The contemporary and bright kitchen can serve as an extension of the suite – with a space to set up champagne and snacks for the wedding party. It is a great space to enjoy with family or friends. Guest Rooms - On the main floor of the house there are two spacious bedrooms each with two double beds. One of the rooms has a full bathroom with shower and a large vanity. The lower floor bedroom is secluded and ideal for families with children or someone who likes to retire early. The Guest House sleeps up to 10 people. The Pavilion - Receptions are typically held in our 40 x 90 pavilion that is equipped with all the trappings needed for the perfect night! The space is finished with a brushed cement floor, optional side walls for cooler nights or rainy days, air conditioning & heat, restrooms, electrical outlets throughout for a band or dj, and bistro lighting on dimmers strung throughout to keep the ambiance in tact. The Carriage House - A pristine and completely customizable space. The carriage house can be used for rehearsal dinners, small ceremonies or receptions, or a lounge area. 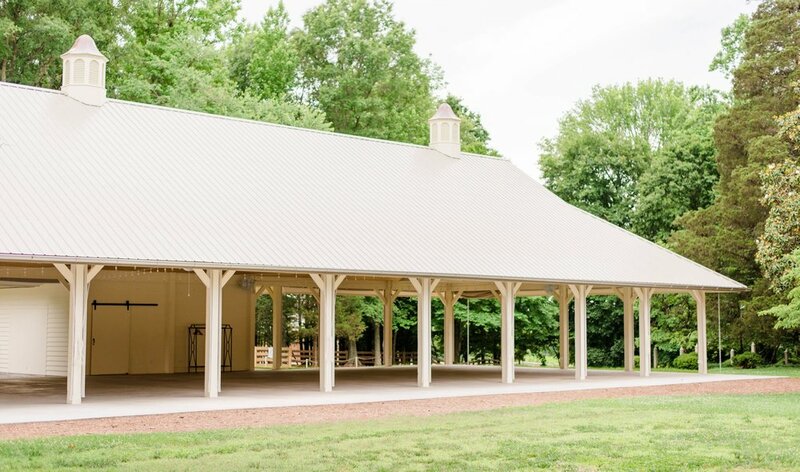 The barn style doors can be opened to expand your event to the outdoors or to add a tent for additional seating or dance space. The Back Lawn - Large historic trees and a beautiful view of the Manor House make for the perfect setting to exchange your ‘I do’s’. With space for all of your guests under the canopy and an easy flow to the rest of the event spaces, the back lawn is the quintessential ceremony location. The Courtyard - Located to the side of the Manor House, the bistro light strung patio is ideal for the start to cocktail hour or for a small dinner party. Enjoy the open air surrounded by the history of Seven Springs as you sip cocktails and enjoy the company of your guests.